`Walking in the shadow of the ‘state’? A review of the joint World Bank – United Nations report – Pathways for Peace: Inclusive Approaches to Preventing Violent Conflict. What causes violent conflict? And how can it be prevented in an interdependent world? These are the key questions taken up in the new World Bank – United Nations report: Pathways for Peace: Inclusive Approaches to Preventing Violent Conflict. These questions are not new, of course, and a huge amount has been written on this topic. One strand of this literature is of particular interest to me: the role of the modern state in conflict. How we understand the state has implications for how we understand conflict, and in turn, the strategies we choose to prevent conflict. The report correctly diagnoses the causes of violent conflict; however, it views political systems where such conflict takes place through the lens of the ‘ideal’ state. Analytically, this leads to an irreconcilable contradiction: the fictive notion of (more or less) stable state authority is used to understand complex political systems in the real world (Willis 2015, p.147). By being so state-centric, the report misses an opportunity to recommend policies for prevention which are grounded in the actual functioning of political systems. The report does not start from a normative position. The authors clearly acknowledge that most countries do not resemble the ideal Weberian state. They are not political structures with a monopoly on legitimate violence, control over clearly demarcated territories, and certainly do not provide security and welfare for their own citizens through rational bureaucratic means (see Das and Poole 2004, p.3-5). Neither are these ‘imperfect’ states evolving inevitably towards a more ‘complete’ statehood. In these countries, violent conflict results as people and groups express grievances about how society ought to be structured, or fight over access to resources or power. Extracted from: United Nations and World Bank 2018, p.78. The solution, the authors suggest, is for these political systems to become more inclusive, or in other words, to become more like liberal, democratic, and functional states. Meaningfully including women, youth and other marginalized groups in the political system, they argue, may prevent and reduce violent conflict. This is a striking shift from the empirical to the normative – from the world as it is, to the world as it ought to be (Lombard 2016). Political systems (and those who exercise power in them) have strong incentives to not become more inclusive, liberal, or democratic (these incentives are observable in almost all countries – whether it be Somalia, or indeed, the United Kingdom). The fundamental weakness of this report is that that the drivers and dynamics of these incentives are neither sufficiently analyzed nor adequately theorized. In other words, the report seems to assume that societies are usually in a state of equilibrium, whether functional or dysfunctional; key events or periods of political and social change can lead to either violence or peace. Many scholars of conflict, however, point to the continuum between war and peace which characterizes many countries on the periphery of the global system – here, war is a part of the modern, day-to-day frameworks of politics (Debos 2016), and politics are continually turbulent. In the sections that follow, I will briefly outline the findings of the report and set out a critique. I will argue that preventing conflict actually requires nuanced and historically accurate understandings of (i) how countries’ political systems actually function, and (ii) the impact of external interventions (whether regional or international) on those systems. The primary message/argument of the report is that prevention is easier and more cost-effective than trying to stop violence once it has begun. This is true for both the ‘countries-at-risk’ as well as the international community. Thus, the report argues, increased efforts are needed to prevent violent conflict, at a time when the longer-term trend of reduction in worldwide violent conflict has been reversed. Extracted from: United Nations and World Bank 2018, p.80. 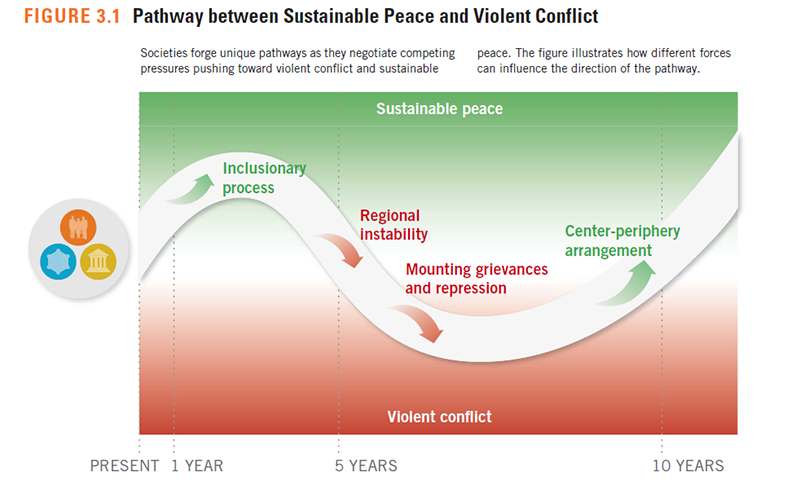 People fight for a number of complex, inter-related, reasons, but broadly, societies move between ‘sustainable peace’ and ‘violent conflict’ depending on the decisions taken by ‘actors’, who respond to and shape the incentives created by ‘institutions’, and ‘structural factors’ in society (see figures 3.1 and 3.2 from the report, extracted above). Many of today’s conflicts (which are intra-state wars) actually reflect ‘group based grievances arising from inequality, exclusion, and feelings of injustice’ (p.109). Collective mobilization by groups around these issues may target the state, or other groups, and may turn violent if there are no viable, peaceful alternatives for expressing grievances. These conflicts between groups play out in ‘primarily four arenas of contestation’ (p.170): access to power, land and resources, demands for equitable delivery of services, and responsive justice and security mechanisms. The report concludes by highlighting some specific examples where ‘prevention’ has worked, and by outlining the multilateral architecture for prevention and peacebuilding. ‘Pathways for Peace’ does an admirable job of pulling together the existing scholarship on causes of violence, and synthesizing it in relatively concise form. Methodologically, it builds on a reasonably comprehensive literature review (albeit with a bias towards large-n, cross-country studies), and a series of thematic background papers and country case studies. Unfortunately, having laid some of the empirical ground-work, the report falls back on the blueprint of the inclusive state, which is well-established amongst policymakers, but difficult to find in the real world. The central actor in conflict is usually the ‘state’. 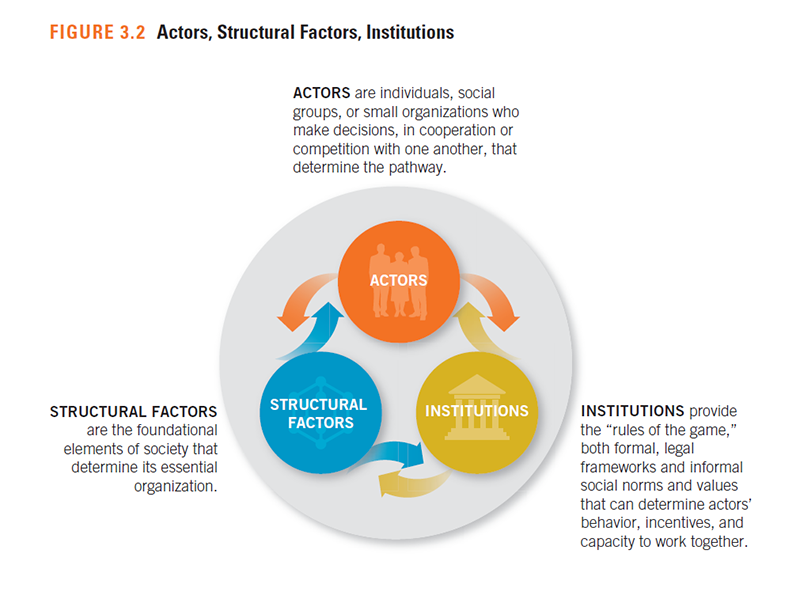 Dominant political science frameworks (as reflected in the ‘Pathways’ report) are usually interested in understanding how fragile or weak countries can make the transition to more orderly, institutional states (see de Waal 2016, p.1). Implicit in this is the presumption that ordered institutional states are the norm, and every other form of political organization, the aberration (see Alex de Waal’s blog post on ‘Theorizing (Dis)order’; Lombard 2016). This methodological bias obscures the actual working of political systems. Let me illustrate what I mean, using two complementary approaches which offer insights into the relationships between violence, politics, and governance. Robert Bates (2008) argues that political leaders are deeply interested in their own survival, and in retaining access to power. He describes ‘political order’ within a state as resting on three variables: (i) the level of public revenue, which is essential to the running of the state and for rewarding those in power; (ii) the magnitude of rewards from predation accruing to those in power, and finally, (iii) the relative value ascribed by those in power to immediate rewards from predatory behavior vis-à-vis the rewards accruing from public service over time. Understanding the interaction between these variables can help us better understand when political order breaks down. In the 1970’s, a global recession resulting from sharp increases in the prices of oil led to the reduction of exports from African countries. Public revenues (dependent largely on trade taxes) declined sharply. In these circumstances, deprived of external rents by the waning of the Cold War, and facing increasing political competition as a result of structural adjustment programmes fostered on them by international financial institutions (such as the World Bank and the IMF), politicians in power became deeply insecure, and afraid for their political futures. Leaders in multiple countries (Zaire, Sierra Leone, and Angola, among others) turned to predatory practices to ensure their own survival (Bates 2008, p.24-26; p.116-7). The framework of the ‘political marketplace’ (de Waal 2015) describes the monetized system of politics observable in many countries in Africa and the greater Middle-East today. In these countries, political authority is not institutionalized. Instead, politics is run on the basis of personal transactions in which political loyalties and services are exchanged for material reward on a competitive basis. Coercion, violence and interpersonal negotiation are the means by which these resources are allocated. As de Waal notes: ‘A ruler bargains with members of the political elite over how much he needs to pay—in cash, or in access to other lucrative resources such as contracts—in return for their support. They exert pressure on him using their ability to mobilize votes, turn out crowds, or inflict damaging violence’ (de Waal 2016, p.1). It is a distinct system of governance: neither a colonial relic, nor a system necessarily destined to be replaced by an idealized state. Yemen is a good example. Roots of its current conflict lie in its opaque and patrimonial political structures, entrenched during the 33-year reign of former president Ali Abdullah Saleh as well as the manner in which Yemen is integrated into networks of regional (and to a lesser extent, global) politics and commerce. Crisis was an instrument of governance in Yemen, allowing Yemeni elite to access resources from external actors keen to maintain political status quo. Yemeni political elite simultaneously created the conditions for political crisis, and then sought to manage these crises, by ensuring that they do not destabilize the patronage networks that sustain the Yemeni state (Phillips 2011). Members of the political elite pointed to their ability to maintain this tenuous political stability to extract rents from foreign actors; at the same time, foreign actors (such as the United States and Saudi Arabia) sought to further their strategic interests through the distribution of economic largesse to the Yemeni elite. A reduction in rents and governmental revenues, accompanied by a macro-economic crisis, provided the spark for increased political competition which erupted into open conflict after the Gulf Co-operation Council mediated transition of 2011. More recently, domestic and geo-political imperatives and rivalries have driven external involvement in its conflict. The key differences between the Pathways report and the empirical frameworks outlined above can be summed up quite neatly using the Yemeni example. The ‘Pathways’ report locates the roots of Yemen’s conflict in the non-inclusiveness of the 2011 transition (United Nations and World Bank 2018, p.192). This seems to imply that the existing ‘political order’ in Yemen was unsettled by a non-inclusive transition. By implication, conflict may have been avoided by a more inclusive transition. In contrast, the political marketplace framework would understand conflict to have arisen because of the turbulent and transactional real-politics of power and material benefit in Yemen. The transition of 2011 represented, essentially, an exchange of power, with no re-alignment of the principles underpinning Yemen’s political economy, although Yemen’s post-conflict National Dialogue process was, in form at least, broadly representative. It followed that key political actors only abided by their commitment to the transitional formula (in 2011) as long it was in their political interests to do so. The difference is an important one. One approach asks: ‘how could the Yemeni political system become more inclusive?’; the other asks “what are the incentives for actors in Yemen’s political system, who stop it from becoming more inclusive?”. This is not a theoretical point – prevention relies almost entirely on understanding the role of conflict in political systems. The normative framework of the idealized state obscures this understanding, and determines which of these questions one asks. Bates, Robert. 2008. When Things Fell Apart: State-Failure in Late-Century Africa. New York: Cambridge University Press. Das, Veena and Deborah Poole. 2004. “State and its Margins: Comparative Ethnographies.” In Anthropology in the Margins of the State, Veena Das and Deborah Poole, eds., p. 3-33. New Delhi: Oxford University Press. de Waal, Alex. 2015. The Real Politics of the Horn of Africa: Money, War and the Business of Power. Cambridge: Polity Press. de Waal, Alex. 2016. Introduction to the Political Marketplace for Policymakers. JSRP Policy Brief 1, March. 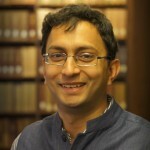 http://www.lse.ac.uk/internationalDevelopment/research/JSRP/downloads/JSRP-Brief-1.pdf. Debos, Marielle. 2016. Living by the Gun in Chad: Combatants, Impunity and State Formation, translated by Andrew Brown. London: Zed Books. Lombard, Louisa. 2016. State of Rebellion: Violence and Intervention in the Central African Republic. London: Zed Books. Phillips, Sarah. 2011. Yemen and the Politics of Permanent Crisis. London: Routledge. Salisbury, Peter. 2016. “Yemen: Stemming the Rise of a Chaos State.” Chatham House Research Paper, May. https://www.chathamhouse.org/publication/yemen-stemming-rise-chaos-state. United Nations and World Bank. 2018. Pathways for Peace: Inclusive Approaches to Preventing Violent Conflict. Washington, DC: World Bank. https://openknowledge.worldbank.org/handle/10986/28337. Willis, Graham. 2015. The Killing Consensus: Police, Organized Crime, and the Regulation of Life and Death in Urban Brazil. Berkeley: University of California Press. These have not been made publicly available at the time of writing.